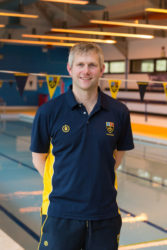 We are delighted to introduce Kelvin Jones, our new Head of Swimming. Swimming has always been a big part of Kelvin’s life, whether having swimming lessons at a young age, competing internationally or coaching at a variety of swim clubs. He started coaching after being forced to give up swimming competitively due to injury. Still feeling passionately about the sport and enjoying seeing swimmers progress, coaching was a natural step. Kelvin coached for a number of years in Wales where he was selected as part of the Welsh regional squads and the Welsh Disability team. Three of the swimmers he coached there competed in the Commonwealth Games on the Gold Coast last year. He then moved to the South East where he’s been Head Coach at three different clubs and gained a plethora of national and regional medals. Specific achievements include British Championship qualification, number 1 ranking in GB disability swimming, plus 5 GB records and 23 gold medals at the National Age-Group Disability Championships. Kelvin says “Alongside coaching I have enjoyed teaching swimmers of all ages and abilities, it’s hugely rewarding seeing a swimmer’s confidence improve!